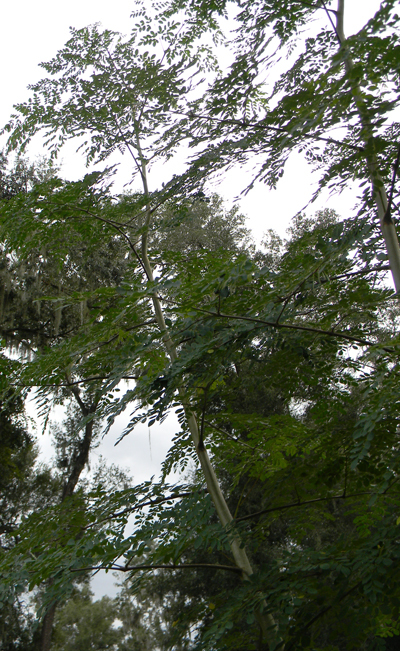 Florida Survival Gardening: Growing Moringa Q & A: Yields, Maturity, Frost Protection, Seeds, Drying, PKM-1 and More! Growing Moringa Q & A: Yields, Maturity, Frost Protection, Seeds, Drying, PKM-1 and More! This week I received two e-mails in the same day regarding moringa growing. Though I'm not a total expert on the health side of Moringa, (my friend Cathy is more amazing than me on that front), I am very good at growing them - and I've got multiple pounds of dried Moringa powder in my office to prove it. Moringa is hot stuff right now. My dad is growing two moringa trees in the Great South Florida Food Forest Project. He was approached by a friend interested in stripping the leaves for re-sale at the local farmer's market. He said no, since the yields on his small trees wouldn't really be worthwhile and he'd rather use them himself. Now... let's see if I can be at all helpful in regards to the e-mails I've received this week. Got your contact information on your Florida Survival Gardening. Hope you don't mind asking a question. I'm contemplating in adding Moringa Oleifera Leaf powder as a supplements to mine, my family and relatives on our daily regimen. I also enjoy gardening, it is very meditative for me, so I'm trying to decide to either grow the trees myself on just buy the dried powder. In as much I love to garden I'm NOT sure how many trees to plant and expect a reasonable amount of Moringa Leaf powder to produce. I also understand that it takes 7 pounds of fresh Moringa Oleifera leaves to produce 1 pound of Moringa Leaf Powder. With that in mind I have a few questions and hopefully you can help me determine what to do next. 1) How old/mature a Moringa Oleifera tree before it start to produce leaves that are suitably and effectively can be used as a supplemental dried leaves ? 2) How much leaves approximately a 6 month old Moringa Oleifera tree will produce ? How about a 1 year old tree? 3) Do you happen to know a source of Moringa PKM-1 and PKM-2 seeds? Moringa powder is an excellent supplement. The data I've seen is quite impressive - it's basically a multivitamin tree. We consume moringa regularly - I dry my own powder here, which is easy since the leaves are very thin. 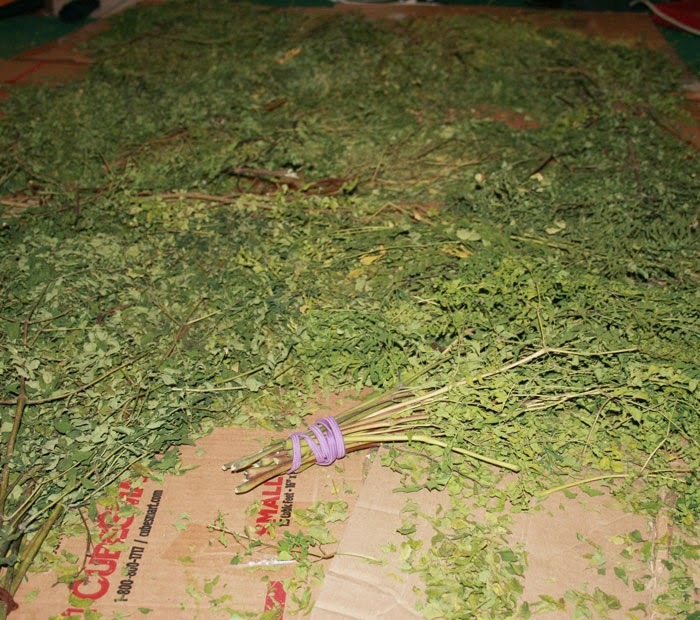 An incriminating photo of moringa drying indoors beneath a fan on a bed of cardboard. If you're in Florida or another relatively warm state, it's definitely worth growing your own. In USDA growing Zone 8 and 9 it will freeze to the ground in winter. If the trees are well-established, however, they'll return. There are specimens in Gainesville that have regrown for 8+ years. Though you can start moringa from cuttings, seeds make much stronger plants. They're easy to germinate as long as the weather is warm - and they'll grow into a 10-20' tree in ONE growing season if conditions are good. So, in answer to question #1: you can start harvesting leaves from a tree that's only a few months old. To get some quantity, however, plant a group of 8-10 trees a few feet apart and keep cutting them back to make them bush out and produce more stems and leaves. I have a patch of 8 trees that make us about 4-5lbs of dried leaves every year. That's enough to keep your family very well supplied with Moringa. Question 2 is tough to answer. If you water and fertilize well (just don't water too much when the trees first germinate - they'll rot), plus keep chopping shoots to encourage branching, you could probably get a pound or so of leaves from a year-old tree. A six-month old tree? Maybe a quarter pound. They really start flying towards the sky at six months but won't reach their full potential until a year or more. Even with freezing to the ground, they grow back again with amazing vigor the next year. They'll do even better if you protect them like I do in this video. Question #3: Where to get seeds? You can get PKM-1 from ECHO or sometimes on ebay or, even easier, on Amazon. I haven't tried PKM-2. Where I live the moringas in my yard fail to set seeds no matter what I do, so it doesn't seem to matter. I've planted seeds from multiple sources and always gotten lots of leaves but no pods. Oh well - they're still worth growing. I just bought five 4 ft. trees that have been in a greenhouse. One has a long brown seed pod. Should I remove it and save it til Spring to plant seeds? Or give it to David Goodman? What is the right choice here? Also, there are lots of leaves and flowers. Should I remove the leaves and dry them? Are the flowers edible? I'm going to try to keep the trees from freezing by sheltering them next to my air/ heat unit against the house with a cover over them when it's cold. Will that be enough? So many questions and cold coming tonight. Thanks for thinking of me, but save the pod for yourself - I've have about three quarts of various moringa seeds in my office right now. Yes, I get a little obsessive. You can remove leaves if you like, or cut them back. They won't mind. At this time of year they don't usually grow very fast, though, so don't expect much regrowth. The flowers are edible and have an interesting flavor. If you're lucky, they'll set more seed pods. The only success stories I've heard of getting moringa to set seed here are A: moringas in pots with restricted roots and B: moringas in really bad soil. I think the stress induces pod set. To keep your trees from freezing, it would be best to bring them inside or put them up against the back wall under a porch or in a shed. 32 degrees will melt them back to their roots. When they're only 4' tall, you might as well keep them from harm until spring, then plant them out. Your plan of putting them next to the air conditioner and covering them is likely the next best thing. My moringa trees in the winter. I hope that helps - thanks you both for writing and allowing me to answer here on the blog. Anyone else have some suggestions for our moringa-growing friends? Leave your thoughts in the comments.